Commander Christopher Ellis, born in England, spent his schooling years in Canada before joining the Canadian Armed Forces in 1987. He attended Royal Roads Military College, and Collège Militaire de Royale; graduating in 1991 with a Bachelor Degree in Business Administration. In 1992, after completing initial Naval training on HMCS Saskatchewan, Commander Ellis volunteered for submarine service. He conducted his submarine training on HMC Submarines Ojibwa and Okanagan, with his dolphins being awarded in August 1994. He then re-joined Okanagan in 1996 as the navigating officer having recently completed the Destroyer Navigation Officer course in 1995. In July 1997, Commander Ellis commenced a two year exchange with the RAN where he was employed as HMAS Onslow’s Sonar Officer, executed the duties as the Manager of Tactical Training at the submarine school, and attended the Submarine Warfare Officer Course. Returning to Canada in 1999, he was then posted to the United Kingdom to conduct Upholder conversion training as the Operations Officer on HMS Ursula (HMCS Corner Brook). 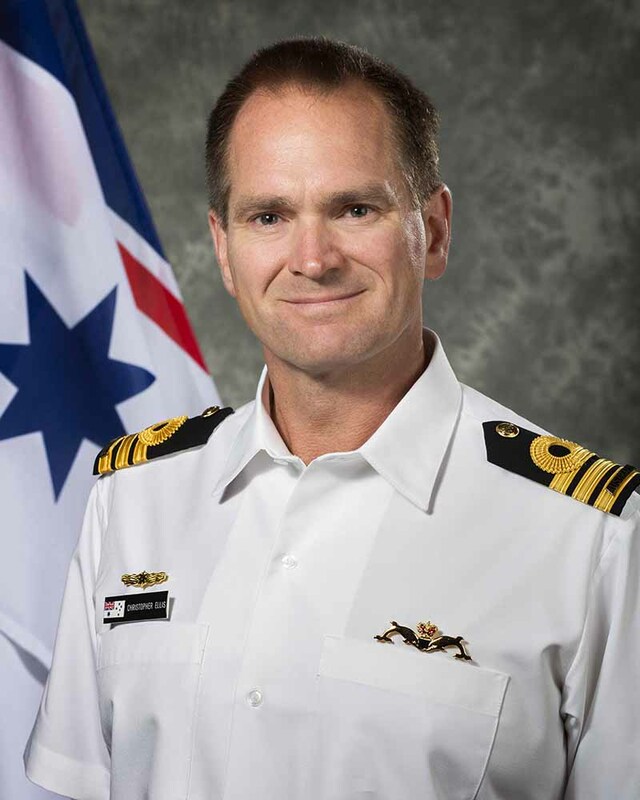 After returning to Canada with Corner Brook in 2003, he attended the RAN Submarine Executive Officer course, and returned to Australia early 2004 to sail with HMAS Rankin to Hawaii. In July 2004, Commander Ellis was appointed the Executive Officer of HMCS Victoria. This appointment concluded with him joining Rankin later in 2005 so as to prepare for an upcoming Submarine Command Course (SMCC). In July 2006, Commander Ellis became the second Canadian to successfully complete the Royal Netherlands Navy SMCC. On his return to Canada, he was promoted to Lieutenant Commander, and appointed Victoria’s Commanding Officer. He subsequently commanded HMCS Windsor for her last operational cycle prior to attending the USN SMCC Class 12 in Groton, Connecticut in January 2007. He then passed the 2008/09 academic year in Toronto on the Joint Command and Staff Programme where he completed his Professional Masters in Defence Studies. In 2009, Commander Ellis was again appointed Victoria’s Commanding Officer, and promoted to Commander. Victoria was the first of Class to complete a Canadian full cycle docking, and then to become weapon certified; a capability that culminated in the sinking of ex-USS Concord while participating in the exercise Rim of the Pacific 2012. On completion of his command in 2013, Commander Ellis was posted as the Deputy Commander of Submarine Operations. Having joined the RAN in July 2017, Commander Ellis is excited about the opportunity to be part of the team responsible for HMAS Collins’ return to the Fleet, assuming command in December 2017.